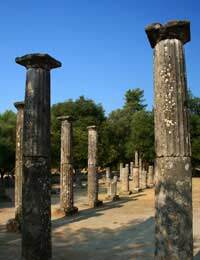 The origin of the ancient Games has not been dated precisely, but official Olympic chronology began in 776BC. At that time, similar celebrations of athletics were held in every Greek city, yet within a century the games in Olympia – dedicated to Zeus - had conquered the entire Greek world and by 576BC their renown and prestige were at their peak. The Games took place every four years, probably at the first moon after the summer solstice, which fell between the end of July and first half of August. Before the ceremonies began, heralds were dispatched to inform the Greek world of the date the sacred truce came into force. The truce did not mean the suspension of ongoing conflicts, but marked the inviolability of the land where the sanctuary was situated. As the Games were linked to the worship of a divinity or hero, only champions judged worthy of competing under the eyes of the Gods took part. An athlete had to prove his Hellenic quality and be “neither slave nor metic” and have committed “neither crime nor piety, nor sacrilege”. He had to train for 10 months - and be celibate during this time to purify the soul and gain courage. Athletes gathered in Elis 30 days before the Games for collective training and the final competitors were chosen. They swore an oath to abide by the rules, on pain of a fine. Competition and training grounds in Olympia were situated outside the sacred enclosure that protected the temples of Zeus and Hera. The famous stadium could hold 45,000 spectators, gathered on the embankment or seated on white marble reserved for dignitaries. Athletes, most of whom competed naked, gained access to the 192.27metre-long track via an arched, covered crypt. According to legend the track measured six hundred times the length of Heracles’ foot. To the south of the stadium was the hippodrome, the length of three stadia (780m). The first Games lasted one day, but later this was extended to five days, with three days of competition followed by a closing sacrifice and a procession and banquet celebrating the champions. No records were kept and team sports never featured. Until the 13th Olympiad in 728BC, the Games consisted of one running event – the stade race over the length of the stadium (192.27m). In 724BC the double stadium race appeared, and then came a long race held over seven, 12 or 20 lengths of the stadium. The short, sprint race remained the most prestigious, however, and the winner gave his name to the Olympiad. Koroibos was the first stade race champion in 776BC and Leonidas of Rhodes was the greatest, winning four times between 164 and 152BC. In 708BC, the pentathlon first appeared. Its five trials were discus, stade race, javelin, long jump – performed with a weight in each hand – and wrestling. Pugilism, the precursor of boxing, was added later. The fights had no time limit and were never interrupted. The pankration, a mix of wrestling and pugilism, was even more violent, as any blow other than biting or binding was allowed. Chariot racing, which was spectacular and dangerous, began in the hippodrome during the 25th Olympiad in 689BC and proved popular at subsequent Games. A champions was crowned with a wreath cut from a sacred olive tree with a golden sickle, had his statue erected in the Altis next to those of the Gods, and became a hero representing his city. Soon cities offered athletes further privileges – tax exemptions, free food and gifts. Athletes turned professional and gave themselves to the highest bidder. Training costs excluded all but the aristocracy and athletic competitions were replaced by bloody gladiatorial competitions. Cheating and threats were used to secure victory, pankration confrontations ended in death, the Games descended into violence and even the sacred truce was violated as the ancient Greek ideal died. The Romans enslaved the Greeks and took over the Games, but to the Romans the spectacle became everything. Crowds were showered with coins and jewels and, occasionally, riots broke out. One overthrew an emperor and caused the death of 30,000 spectators. The Games became an instrument of government, were ruinous to organise and were surrounded by corruption and embezzlement. They disappeared forever in 394AD when abolished by Christian Emperor Theodosius I. A Gothic invasion a year later destroyed the Olympic site. Two earthquakes and a flood obliterated Olympia, but in 1829 archaeologists rediscovered the city's ruins.